It is proverbially known that you can tell a lot about a person by how they treat animals. The lines of thinking are several: that it's a gauge of kindness and care; that it demonstrates selflessness to care for those who can do nothing for you; or that there's a slippery slope (if you could hurt an animal, its a short path to mistreating humans). These are probably all excellent reasons for paying attention to how people treat animals. But for me there's a better approach to understanding character -- you can actually best tell about someone by how animals treat them. Animals should be the litmus test because animals have very little self-interest. They are ready to give love wherever it can be bestowed worthily. They don't care about money, status, career or your friends. And they don't care if the picture is a flop. Animal love isn't readily faked. If an animal likes you, you are likable. It should come as no surprise that animals loved Buster. 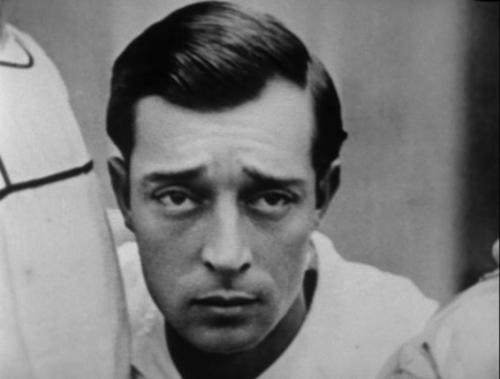 Examples abound in his movies, but these are some of the best. 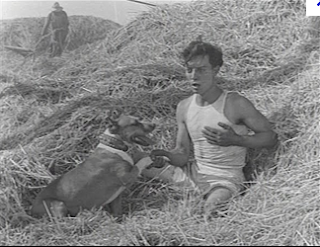 From his earliest days on screen, (The Butcher Boy, The Cook and The Garage) Buster began to forge a special relationship with Luke the dog based on chemistry and affection. But in Keaton's movie The Scarecrow, there is more -- a sense of mutual respect among performers. Luke was a smart dog with lots of film experience - and here is Buster shaking his hand in The Scarecrow to signal a truce in their shenanigans. Its a sweet and funny moment and it matters to the movie because Luke's respect probably actually mattered to Keaton. 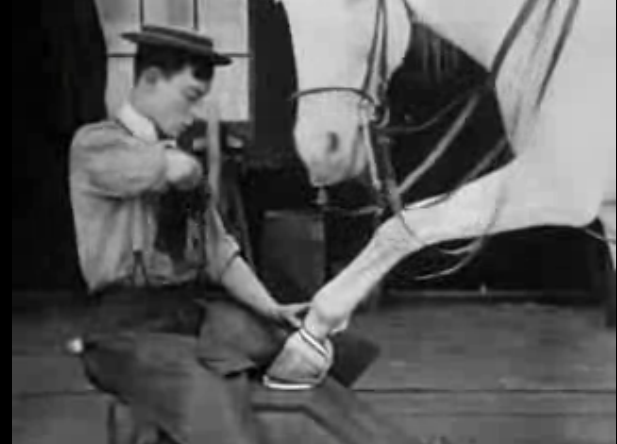 The Blacksmith features a delightful scene where Buster treats a beautiful white horse to something of a spa day when a customer comes in wanting her shod. He shows the horse some shoes that aren't to her liking, then he selects some great strappy sandals and the horse is charmed. She even gets her nose powdered while the two seem to share a meeting of the minds. Buster and his equine friend hold court charmingly together for several memorable minutes. 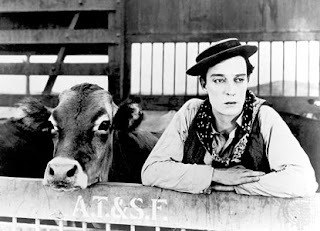 In Go West, we get to see Buster's soul through the eyes of an adoring cow. "Brown Eyes" is beautiful and her clear desire to be near Buster is evident. You have to trust the cow, given that she cannot have cared about the movie biz. You might argue that she only responds to him in such a special way because he reportedly spent many days taking the cow everywhere he went, building her trust. Hanging out with a cow, huh? That seems to speak volumes itself -He not only cared enough to take the time to win the cow's love, but he was smart enough to know that it mattered. 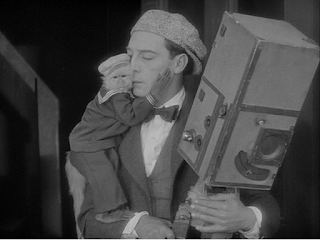 You'd be hard pressed to find a cooler simian/human relationship than the one we get to enjoy in The Cameraman. Co-protectors, friends, and helpmates they are the most touching team. And play off each other with a beautifully seamless and natural style. The way that little monkey just clings to Keaton from the moment they meet leaves me speechless. And that's saying a lot. Here is a man beloved not just by the masses, but by creatures great and small.